Details relating to the Maltese Commemorative of 2018. The coin is dedicated to the prehistoric temple complex of Mnajdra to the South of Qrendi. The temple complex is thought to have been built between 3,600 and 2,500 BC and is amongst the most ancient religious sites on earth. 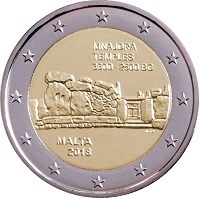 Close by is the temple complex of Hagar Qim which is on the Malta’s commemorative coin of 2017. It is thought from the orientation of the temple’s construction that it may have been used to mark the summer solstice and the equinox. In 1992 Mnajdra the declared a UNESCO World Heritage Site. In the bottom left quadrant are the issuing country and the year of issue: MALTA 2018. Return from Maltese Commemorative 2018 to euro coin collector.